Our March safari tour with a small group is to northern Namibia and Botswana includes a day in Zimbabwe to visit the Victoria Falls. One of the highlights is the Okavango Delta where we stay in a remote private lodge to discover the flora, birds and wildlife in the green season. The elephant population of the Chobe National Park is amazing. Diverse verdant green landscapes, dramatic skies, unspoilt wilderness with game, bird-life, insects attracted by the fruiting trees and lush vegetation. We visit Northern Namibia, the Etosha National Park and the Zambesi region (formerly the Caprivi Strip), Kwando/Linyanti delta continuing to Botswana, the Chobe National Park and the Okavango Delta. Namibia and Botswana are two of the last adjoining unpopulated wildernesses and are very safe destinations. Both countries aim for low density, high quality tourism. We have included a day to visit the Victoria Falls in Zimbabwe, now with its infrastructure and economy improving. 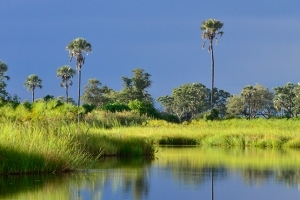 The Okavango Delta is fed by the floodwaters of Central Africa. These waters fan out into the Delta, forming a wetland system of beautiful palm-fringed channels, lagoons and islands which support a rich diversity of fauna and flora. The waters eventually disappear in the Kalahari Desert. Our lodges have been hand-picked after extensive research. They are well-run, comfortable and typical of their surroundings. During the journey we always stay at least two nights at a lodge to enjoy the activities particular to each region. The lodges are small and often cater just for us. Our guide/driver, Siggi Straube, is from Namibia and is a top-rate guide and photographer. The local lodge guides are well trained and their knowledge of the flora and fauna is excellent. The group is small, maximum ten guests. We travel in a coach well-built for the terrain and comfortable. Flights are with South African Airways and the local private charter, Moremi Air, for the Delta. Morocco – the Sahara Dunes, Draa Valley and Atlas Mountains tour, our destination for ten days in April is an unforgettable experience. The amazing landscapes with kasbahs, lush palm groves and then the desert. So serene and fascinating, we spend three nights there in a small luxury camp. We combine three contrasting regions of Morocco: lush valleys, the high Atlas Mountain passes and the Sahara desert. Intertwined come elements of history, agriculture, Berber and nomads’ culture, and a chance to experience life in the desert. April sees life returning after the winter rains; warm during the day with the temperature dropping at night. We spend three nights in the dunes in luxury tents, each with its own simple shower system and private facilities. For two days we discover the dunes with their plants and creatures, a way of life in a tranquil, atmospheric world apart. We are accompanied by a guide and a team of helpers to ensure an unforgettable visit to the desert. The first and the final nights are spent in the welcoming, comfortable Hotel Le Beldi, near Marrakech. Surrounded by a field of roses and extensive gardens, the hotel rooms are of authentic, contemporary style. In the Draa Valley our riad hotel is in the Palmeraie de Tamnougalt, with excellent cuisine from the owners’ organic farm. On the desert edge our accommodation is a charming riad, to relax overnight before our adventure into the desert. Bab El Oued is a little piece of paradise, located in the middle of the Palmeraie de Tamnougalt, at the foot of the ancient, scenic kasbah. The garden is beautiful and well-maintained, with a nice little pool at its centre. You wake to the singing of birds and the call of the peacock. The group is small with maximum ten participants and accompanied by Susan. We travel by minibus as far as the desert and then by 4x4 vehicles and dromedaries. Our November 2016 tour to the Namibia Deserts, Dunes and Canyons is described in our blog – tour report. Click here to read the full article. The Kalahari Desert, Fish River Canyon, Namib Desert and Sossuvlei Dunes, Swapokmund on the Atlantic, Erindi Game Reserve have such a rich selection of desert flora, wildlife, birds together with amazing geology and landscapes. Namibia features again in November. Our first Namibia Safari Tour is to the Sossusvlei Dunes, Fish River Canyon, the Kalahari and Atlantic Coast much enjoyed by our guests for a number of years. Our new tour is a Skeleton Coast Safari in north west Namibia. An exceptional tour to include three nights at a remote lodge, the only concession with access to the wildest part of the coast. We add lodges with conservation projects for black rhino and for cheetah. Both tours are for small groups under 10 participants. An amazing country of sweeping landscapes, impressive mountains, fascinating geology with the oldest dunes in the world, canyons and deserts. 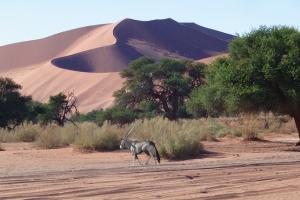 Namibia has wide-open spaces with few inhabitants but a wealth of flora and fauna all adapted to the environment. Our itinerary covers the central and southern regions of the country, malaria-free zones. The lodges and guest farmhouses chosen are small with all comforts and good food. They are attractively designed in typical vernacular style with breath-taking views and always a friendly welcome. After each travel day, we spend a relaxing day around our chosen lodge with the emphasis on local activities. Our road travel is in a comfortable vehicle adapted to gravel tracks which form a major part of our journeys. We are accompanied throughout by an excellent and knowledgeable local guide, who is also a professional photographer. Namibia is such a diverse and fascinating country. The Skeleton Coast is the focus of our journey to a vast, remote region in the north west known as the Kunene. The absolute highlight is the three days at Hoanib Camp, in an isolated mountainous wilderness with desert-adapted wildlife and flora, and a unique chance to experience the dramatic shores of the Skeleton Coast with seal colonies and shipwrecks. We start our journey after an overnight stay in Windhoek and fly to the Palmwag Concession in Damaraland and to the Desert Rhino Camp where the largest free-ranging population of black rhino are being protected in the Save the Rhino programme. After two days we fly to the remote Hoanib Camp for three nights with amazing activities during the day including a trip to the coast. Situated in the protected Skeleton Coast area, access is very limited. On leaving Hoanib, we spend two days at Mowani Lodge in Damaraland. 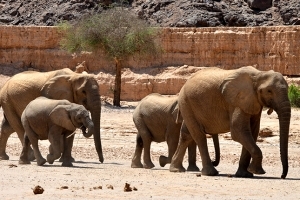 Desert-adapted elephants, lions and cheetahs can be spotted on our game drives. Our lodges have been hand-picked after extensive research. They are well-run, comfortable and typical of their surroundings. Our guide/driver, Siggi Straube, is from Namibia, a top-rate guide and photographer. The local lodge guides are well trained and their knowledge of fauna and flora is excellent. The group is small, maximum 10 guests. Internal flights are with Wilderness private charter planes. For some of the journey we travel in a coach well built for the terrain and comfortable. Overnight flights from London Heathrow are with South African Airways. We can arrange extensions to the tour for you to discover more of Namibia with our guide either by vehicle or with charter flights to remote regions.